Allegedly sold thirty two years of real property records in bulk. Foreign corporations sell U.S. records online. Four title insurance companies recently filed a lawsuit against the registers of deeds in five Michigan counties after they were informed they could no longer resell the bulk data sets they purchased at discount prices from the counties. The five Michigan counties named in the suit were Eaton, Lapeer, Newaygo, Saginaw and Tuscola. The title companies alleged that the registers’ actions violated several laws including the Sherman Antitrust Act, the Due Process and Equal Protection Clauses, and one Michigan law that prohibits county registers from maintaining systems of abstracts of title. The title companies who brought the suit were: First American Title, Chicago Title, Lawyers Title and Transnation Title. The county registers in this lawsuit maintained that they had done nothing to prohibit or limit the companies’ access to the county records. They had each acted responsibly by recording all instruments conveying interests in land and maintaining a grantor-grantee index of these documents. They were merely limiting the resale of information that had been purchased from the county at a lower cost than the taxpayer traditionally paid. The counties also stated that they would have no problem with the companies’ resale of the information if they were willing to pay the traditional fee that the taxpayers were paying for access to the public record. For several years prior to this lawsuit being filed, the title companies had been able to purchase the bulk data sets from counties at discounted rates and each had built large indices within their own firms that maintained the various counties’ records. Due to the expense of this process, the title companies claimed that they often had to resell the information they had gathered from the counties to other parties, including other title insurance companies. In addition to these claims, “the title insurance companies consider themselves to be in competition with the registers in a market for public documents,” according to the language contained in the suit. Under Michigan state law, anyone requesting a a public record is charged $1 per page for a paper copy. The Michigan Legislature set this statute and this is the maximum cost any county can charge for a copy. Additionally, anyone who purchases the paper copy at this cost is permitted by law to share the record with whomever he chooses. The counties had entered into the agreements with the companies to sell them the information at discounted rates due to the volume they were purchasing. Yet, under the rules of their agreements, the companies were required to enter into a licensing accord that prohibited them from sharing, or reselling, this bulk data with others. One county named in the suit – Tuscola County – has never provided bulk data and has always required that anyone who wanted access to a county record had to pay the $1 per page copy fee. 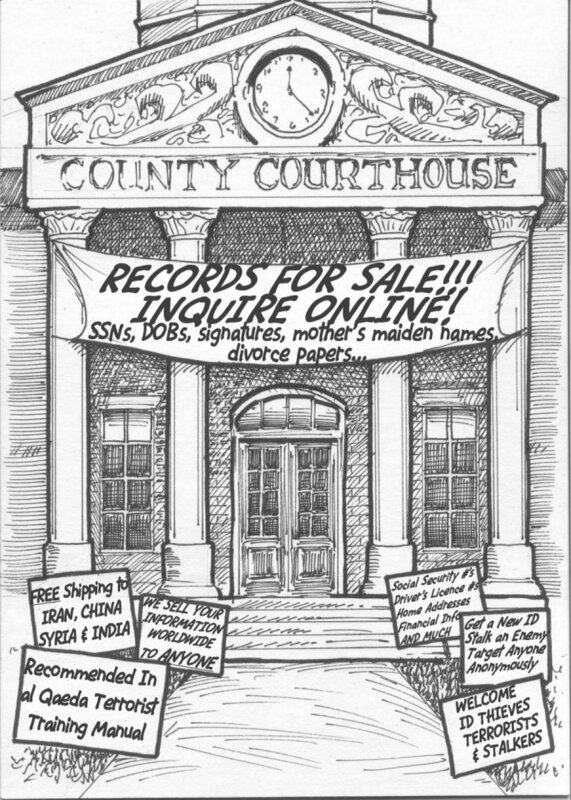 In November of 2004, the Michigan Court of Appeals ruled in an unrelated suit that Lapeer County was not guilty of violating a title company’s rights by refusing to allow it the right to resell the information it purchased from the public record. The court also ruled that the county register had not been guilty of violating the Inspection of Records Act, the Freedom of Information Act, or the Headlee Amendment. Although the Lapeer title company who brought the suit has appealed the court of appeals’ decision, it is still under application at the Michigan Supreme Court level. Finally, the title companies were claiming that the counties were keeping tract indices, also known as a system of abstracts of title. Under Michigan’s state law, any county with a population of less than 900,000 is prohibited from maintaining tract indices unless a majority of its voters has elected to establish such a system in a general election. The four title companies were claiming in this suit that the counties in question had built these indices and did not fulfill either of the two aforementioned qualifications. The suit claimed “the registers are nonetheless currently maintaining tract indices on their Internet websites, and that these tract indices are systems of abstracts of title which are prohibited by statute." Thus, in reviewing the claims made against the registers by the four title insurance companies, three counts were stipulated that contested the actions of the registers to limit the resale and distribution of the bulk data they purchased from the public record. By forcing them to pay higher prices, they also claimed that the counties limited their access to the public record. Therefore, count one of the suit alleged that the registers actions’ created a monopolization of the county records and, thus, the anti-competitive practices placed them in direct violation of the Sherman Antitrust Act. Count II cited violations of the Due Process Clause and the Equal Protection Clause and the third count alleged that the counties had violated Michigan statute by maintaining tract indices within their county records. On June 13, 2005, Judge John Corbett O’Meara of the United State District Court, Easter District of Michigan, Southern Division, ruled on the case. According to two county registers that were directly involved with the case, Mildred Dodak of Saginaw County and Ginny McLaren of Tuscola, his decision may spell relief for county registers facing similar problems throughout Michigan and, perhaps, throughout the United States. Concerning the first count that accused the counties of violating the Sherman Antitrust Act, O’Meara dismissed the claim by upholding the decision previously determined in the Lapeer County decision in 2004. He referenced the court’s decision that stated: simply as an exercise of the general power to contract, defendant has the authority to propose and enter into contracts in which it provides concessions, such as a reduced bulk rate fee, or copies in microfilm form, in return for a purchaser agreeing to special conditions, such as a restriction on the use of the copies provided… further, the negotiation of such contracts is within the broad statutory grant of authority provided for the care and management of the property and business concerns of the county. O’Meara refused to rebuke the judgment of the Michigan Court of Appeals in the previous case and utilized its stance on helping him make his decision in this matter. He also stated that Tuscola County had not acted inappropriately in not providing the title insurance companies with discounted rates for copies from its record. The plaintiffs had alleged that “not providing discounted bulk rates is a violation of antitrust principles.” Yet, according to O’Meara’s ruling, the register was only acting pursuant to statutory directives by providing paper copies at $1 per page. No law requires a county register to offer title insurance companies copies at a discounted bulk rate. When asked by Source of Title why she believed the title companies had pursued this at the federal level, Mildred Dodak was quick to say that she believes they were assuming they would lose at the state level. She also stated that she was unaware that the title companies were building large title plants utilizing the information they were buying from the counties. She did admit that she knew the smaller “mom and pop title companies” were dwindling, but did not realize it was due to the title plants being built by the larger title companies. She expressed concern that the bulk data sets of records were expediting the closure of the smaller companies for the economic gain of the larger entities. Another concern over the resale is the fact that the counties are so reliant on state revenue sharing, but that its reduction has had significant impacts on the counties’ budgets throughout Michigan. Dodak had an independent inquiry conducted prior to the filing of the lawsuit to determine what the county had lost due to the discounted rate it offered to title companies. The inquiry uncovered that the discounted rate was costing them more than 16 cents per copy than what they would have been recouping from selling the images at full price. Following the ruling in the Lapeer County case, she said that she moved her county to a “no-resale policy” in order to recoup the losses it had suffered from the reduced cost rates it was offering those who bought the records in bulk. If the title companies still wanted the CDs at the reduced rate, they were required to sign contracts that prohibited them from reselling the images under the terms of Saginaw County’s new policies. Following the court’s decision, Saginaw County will not be offering CDs at 20 cents per image to the title companies. If they wish to purchase the CDs, Dodak said they will be paying more than 20 cents per image, but her county has not yet defined what the cost will be. Additionally, Dodak will require the companies that purchase them to sign a contract that contains a “no-resale” clause. If they purchase the paper copies at $1 per page, however, she has no problem with the resale of the documents by the title companies. Ginny McLaren, the Register of Deeds for Tuscola County, agreed with Dodak that the decision passed down in the federal court in Michigan may lead to similar decisions throughout the country. McLaren stated that she believes O’Meara’s decision further defines that the county registers were only doing what they were supposed to do to protect the records and the constituents. When asked if she was surprised by the decision of the court on the first count, McLaren admitted that she was not and would have been surprised had they not interpreted the laws the way they had. Both of the registers of deeds stated that they believed the larger title companies were grasping at straws in the lawsuit they brought. Because the small companies and the counties have less funding for maintaining their records and purchasing greater access to them, McLaren added that she believes the larger title companies have built more of a monopoly of the records than anyone. The wealth and the power the companies often wield are much greater than small businesses or counties have. Both Dodak and McLaren were surprised that the title companies had accused them of helping one private interest group at the expense of the other. Both believe that the title companies have forgotten that they have built the record for the county’s constituents and not for private interest entities. Dodak also expressed contentment with the court’s ruling and the judge’s view of what he established on behalf of county recorders. On the third count, which focused on the counties’ establishing tract indices, the judge did not rule. O’Meara did state, however, that the third count would be further examined at a later date. He referenced in his decision that “plaintiffs point to the websites of the counties, which provide databases searchable by legal description or address, and claim these are tract indices.” Because neither party had engaged in discovery over the third count, he stated that a ruling could not be made at that time. Additionally, O’Meara stated that “the court notes that there may not be a private right of action for the title companies to enforce this statute.” Both Dodak and McLaren said they would be surprised if the July 6, 2005 hearing on the final count establishes any action that the companies may be able to take against them. Both admitted that they were pleased with the decision that the federal court made on count I and II and did not anticipate further action would be taken on the third count. Source of Title contacted the senior counsel for the title companies, David Ettinger of Honigman, Miller, Schwartz and Cohn Attorneys. However, he was unavailable for comment as of the date of publication. Source of Title launched in September 2002 as a directory to help title industry professionals locate independent settlement service providers. Since then, Source of Title has added forums and full-service news content targeted at industry professionals. For additional information on Source of Title, or to learn about advertising opportunities, visit http://www.sourceoftitle.com/.